/ Ramps / Roll-A-Ramp - 26"
The wider version of the 30 inch makes the item a bit heavier to handle, but we preferred the added width for rolling a wheelchair in and out of our van. We are looking at a way to mount the ramp as a bi-fold in order to avoid unrolling and lifting it in and out of the van for each use. 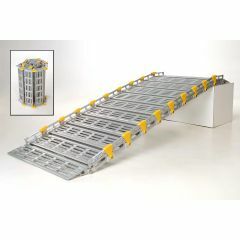 We like the unique design and the quality construction of the roll a ramp. The only reason that I gave it 4 stars instead of 5 is that the actual ramp is a little shorter and thus steeper than I thought it would be because a good portion must be put on the upper ledge of the stairs. Even with that unexpected characteristic, the ramp works well and is a nice alternative to having to build a permanent one. Difficult to Store. Bulky. Difficult for Travel. Middle Age Disability. Long Term User. The product supports my powerchair and me or me, my wheelchair and caregiver with ease. I thought it was black due to all the pictures I saw but turns out to be metallic. It hasn't been weighed but appears to be heavier then the 37lbs stated. Not easy for transport. We are able to use this in the garage for winter by angling our vehicles around it. This means we can go without having to use snow covered wood ramp outside. We can also roll it up and take it for a visit to other family members' homes. Do you have a showroom of some kind where I could practice lifting and rolling it so I know it will work for me? Do you have a contact phone number to order by phone? Will Medical Assistance pay for a portable ramp if the patient is in a wheel chair? what is the weight when folded? how much does it support?.... MOTORIZED WHEEL CHAIR? Do you have one that is 20 or thirty feet long?